Acne is not just a problem for adolescents going through puberty; many adults struggle with this skin condition and it can be uncomfortable and embarrassing. Yes, even your favorite celebs are still regular human beings that experience acne breakouts just like the rest of us. If you’re one of the countless people who suffer from acne, redness, whiteheads, blackheads, or bad skin, take a look at these tips from stars and their professional dermatologists and aestheticians on the best ways to combat a skin crisis. 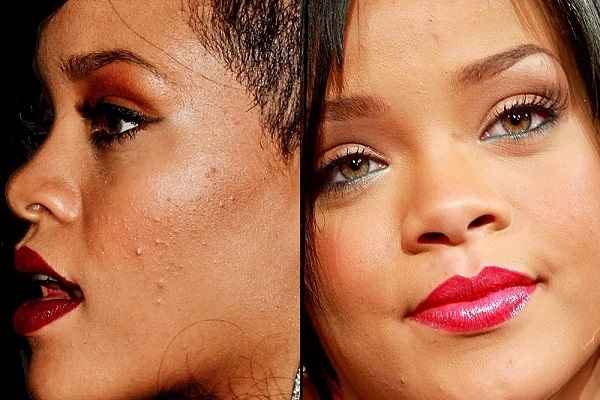 Unlike Rihanna, not all of us have makeup artists to cover up our acne scars. However, new acne treatments are becoming more readily available. Many people these days are choosing laser therapy, a common dermatological practice for getting rid of scarring caused by bad acne. If this is a problem for you, it may be worth speaking with your dermatologist about laser treatments to reduce the appearance of acne scars.